Andrew Parrott is a master of musicological detective work known for his adventurous and uncompromising scholarship. He is also internationally known for his pioneering historically informed performances and recordings of pre-classical repertory. This new release combines the best of both, resulting in the first full reconstruction and recording of the funeral music for J. S. Bach’s patron, Prince Leopold of Cöthen. Bach’s years in Cöthen were musically fertile and Prince Leopold was a knowledgeable and committed supporter of music and the arts, so it’s ironic that much of Bach’s output during those years has been lost or even destroyed. 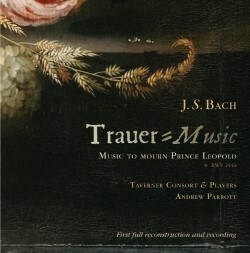 The score for Trauer-Music, written in 1728 on the occasion of the Prince’s sudden death at the age of 34, has almost completely disappeared, yet through the discovery of numerous clues in other works and writings, Parrott has been able to reconstruct what was clearly a heart-felt homage. 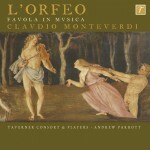 Parrott conducts the renowned Taverner Consort and Players, the organisation he founded in 1973, and a superb roster of baroque vocal soloists. A unique document and superb performance make this a recording for classical music aficionados and lovers of Bach’s music alike.